Last April, we introduced everyone to the 2nd group of chickens we added to our flock. I am happy to say that they have all just turned one year old and they are doing really well! Things are slightly different from the photo above, as Fiona turned out to be our boy "Roosty Roo" and we have changed Felicity's name to "Red" in honor of my grandma. And of course now they are not awkward little chicks anymore - they are all fully grown and provide us with lots of beautiful, delicious eggs. I am really glad that we decided to add more chickens last year. I have learned so much since then about flock dynamics, especially about integrating flocks and dealing with two roosters in one flock. It is always interesting to watch how they all interact and establish a new pecking order to keep peace in the group. And now, since we just brought home five new chicks last week, we get to do it all over again. I love how chicken keeping is ever evolving, and you learn as you go along. The chickens always keep me on my toes and manage to teach me a lot; not just about them, but also about who I am. They have become such an important part of my life that I don't even know who I would be without them. It's hard to explain unless you've experienced it yourself, but these sweet creatures drive their way into your heart and leave an impression forever. I feel blessed and honored to be their caretaker while they are here on this Earth. I completely agree with your sentiments. They are so important and such an integral part of who I am that it is beyond explaining. It just is. Love Me Love My Hens. It's my dream to have chickens someday. Yours are lovely. They look so healthy and clean and happy. And I can't believe that beautiful basket of eggs--all the different colors! the eggs are beautiful! Congrats to the winners of your seed starters giveaway. Tammy, you chickens are so cute! The white one on the end is beautiful. Happy Friday! Love reading about your chickens :-) They're all such individuals. They have grown up to be such fine looking ladies:) Nice that you are adding to the flock. What a great looking bunch they are! Happy First Birthday to them!! Happy Birthday chickies! You've done a great job taking care of them. Enjoy! 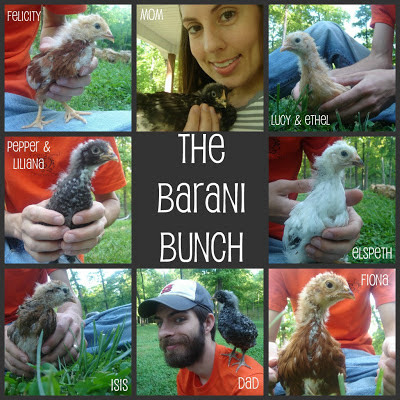 The Barani Bunch -hahaha - so cute! I also really love the one of the chickens together. It looks like the dynamics of that group could be interesting to watch. Just love that first picture - the Barani Bunch, so adorable. Happy about the new chicks and they sure are happy and doing well! The Barani Bunch - LOVE it!! I love your kind and gentle heart. And your photos. Raising ans tending to our chickens is just so relaxing and rewarding. Aw, beautiful birds! We just added Ava (as you saw on my blog). I was worried adding her to the flock, being only one, but she's held her own and after some initial pecking order "arguments" she was roosting with them on the 2nd night. And we have 3 Welsummer chicks coming up, but at least they'll be added together. That's too cute, love your photos! Reading your posts makes me miss my chickens. Hopefully we will have another property soon so we can raise another flock! They are so cute! My hens layed their first egg yesterday! Happy 1yr Birhday! Love your chickens! Wish I had more time for some of our own. I love how you name your chickens and each one seems to have it's own personality! I can see why they become so much a part of your. Simply adore your chickens and yes I can guess how you feel about these lovely little creatures. And they are so lucky to have you as their Mom;0)...love the Brady Bunch picture...I showed it to Don and he smiled! Happy Birthday to your clan!! Have a great weekend!! I love your "before" and "after" pics of your chickens. They are a nice looking flock. Keep the chicken photos and stories coming! I love all your pictures. It's so funny that each chicken seems to have their own personality! It will be interesting to see how you are able to blend the babies with the elders!! Neat that all the different types of chickens do get along even with different personalities. They all look so healthy and happy!! Fun!! OHHHH - and love your different color eggs! By chance, is there a difference in the taste of the different eggs and breeds? Your chickens are beautiful, and what lovely eggs! They are so beautiful with the different feathers! Lovely eggs too. what an adorable post! i love all your photos, especially the collage. i have to say that your chickens are so beautiful! Tammy what a wonderful post, I love it. Your girls are lucky to have you both. Congrats on your new additions, super fun! My brooder is ready and still waiting for me to pick a few more girls myself. Your photos are cute, the mosaic is darling, so sweet. Super love your egg carrier too. Happy Earth Day and Happy Monday friend! love the photo of the ladies all lined up! makes you smile! Such a wonderful post! I feel very much the same way you do about my chickies. Oh what adorable pictures! They are all so cute and look at all those eggs! I'm sure your chicks also feel blessed and honored. Your eggs are gorgeous. And you make chicken-keeping sound like so much fun! Beautiful pictures and beautiful post, Tammy! You are lucky to have each other! Beautiful girls! We just got 26 chicks last week. Looking forward to having a flock again. It's been a few years and I have missed fresh eggs. I agree, keeping chickens is fun. I enjoy watching them. It makes me laugh everytime I take out my "chicken bucket" of scraps and they come a runnin! There is a real hierarchy with birds, we found out the hard way too! Great shot of the eggs and boots. Love that point of view. Looks like we are on a similar schedule with year old gals and new babies! Fun!